General strawberry (Fragaria vesca) belongs to the rose family (Rosaceae). It is a perennial herb with oblique and brown colored rhizome, which grows out of the ground leaf rosette. The leaves are petiolate and trojlaločnaté. Fruits, berries are small, yellowish-brown achenes zdužnatělém květním sitting on the bed. At maturity are easily separable from the goblet on which are bent backwards calyx. For us grows on the edges of forest clearings or limits or grassy hillsides. It spread throughout Europe and Siberia and wild form occurs in basically all over the world. Strawberry there are a number of species, forest strawberry itself is confused with strawberry higher (truskavcem) or chlumím (lawns). Industrially derived are obtained from fruits of strawberry, which are mostly hybrids of Virginia and the Chilean strawberry. However, the pharmaceutically merited, nor do they contain as active substance in general strawberry. The most important active substances include tannins, flavonoids (rutin and quercetin), mucus, vitamin C (ascorbic acid) and essential oil with lemon scent. As a medicinal drug is collected young leaves with short petioles parts. They have a bitter, mucilaginous and slightly bitter taste. It has a slightly astringent and anti-inflammatory effect. This effect can be used for example in intestinal flue, or diarrhea , also also in diseases of the kidney and urinary tract . In combination with raspberry and blackberry leaves is used as a substitute for real tea. Externally it can be used as a gargle for inflammation of the oral cavity . Although the leaves are medicinal drug, it is necessary to mention fruits. Strawberry fruits also known as wild strawberries contain higher levels of salicylic acid and other organic acids as well as sugars, vitamin C, flavorings, pectin and tannins. Collection of wild strawberries growing today pushed garden varieties that do not reach the flavoring properties of wild strawberries. Although most valuable are fresh, nutritious and very tasty they are also modified. It has long been one of the housewives prepare marmalades, jams, compotes, juices, wine, etc. In folk medicine is used as woodland strawberries weakly diuretic, especially especially fresh when sclerosis , high blood pressure , kidney stones , rheumatism and other diseases. After consumption of large quantities may, in susceptible individuals (eg often in children) cause hives, scrapie or other allergic symptoms. 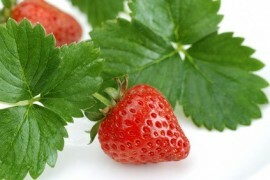 Extract of strawberry (whether on leaves or fruits) can be found in the product Vascular elixir or raspberry mixture .